Smart Watch stories at Techdirt. stories filed under: "smart watch"
We've long noted how the painful lack of security and privacy standards in the internet of (quite broken) things is also a problem in the world of connected toys. Like IOT vendors, toy makers were so eager to make money, they left even basic privacy and security standards stranded in the rear view mirror as they rush to connect everything to the internet. As a result, we've seen repeated instances where your kids' conversations and interests are being hoovered up without consent, with the data frequently left unencrypted and openly accessible in the cloud. When this problem is studied, time and time again we're shown how most modern, internet-connected toys can be fairly easily hacked and weaponized. Granted since we haven't even gotten more pressing security and privacy problems tackled (like the vulnerability of our critical infrastructure), problems like Barbie's need for a better firewall tend to fall by the wayside. "I proxied the iOS app through Burp and could see that the traffic was not encrypted. Personal and sensitive information could be entered into the application such as phone numbers, passwords, as well as information relating to children. Profile pictures, names, gender, date of birth, height, and weight all transmitted across the internet in cleartext." "The watch did have some protection against arbitrary people calling the child. It implemented a whitelist of authorised phone numbers that the watch would both call and receive. The problem with that is that Caller IDs can be spoofed. So as a proof-of-concept, I used crazycall.net to spoof the Caller ID to a test watch. Using the data from the API, an attacker could get both the child’s and a parent’s phone number, and spoof a call to the watch. As shown below, the child would think that it was their Dad that was calling. Would a child do what they were asked if a call came in like this? 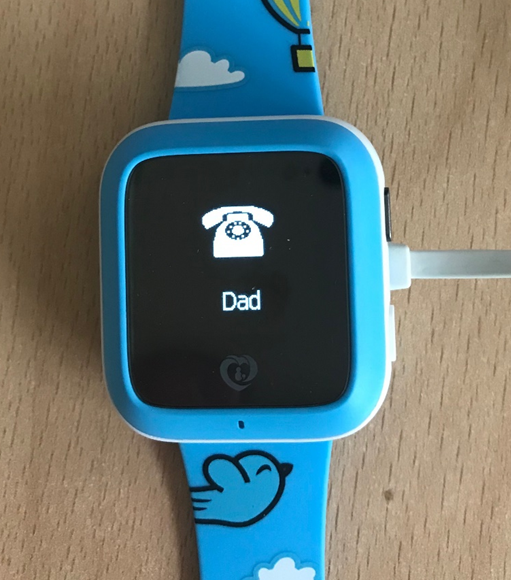 Of course like so many IOT devices, MiSafes' child-tracking smartwatches, which have been on the market in since 2015, are made by a Chinese company that had no interest responding to inquiries by security researchers. And being sold at around £9 ($11.50) per pop, there's certainly no incentive for its makers to suddenly start dramatically improving their security and privacy standards. It's another reason why efforts to standardize the inclusion of security and privacy problems in product reviews is something we all need to get behind, since it's abundantly clear legislation and regulation alone can't really address the problem. There are now tons of smart watches on the market, many from smaller players, but the big guys are increasingly moving into the market as well. While many are still not convinced of the smart watch concept, as a happy Pebble owner, I can say that it really does change my relationship with my phone (i.e., I use the phone a lot less, and am better able to stay informed on important things, without having to constantly pull out my phone). For me it's been pretty powerful. That said, for this week's awesome stuff, we're looking at three crowdfunding projects for things that aren't quite smart watches, but might interest some people who are curious about smart watches, but haven't quite made the leap yet. First up, we have the Sim. Rather than a smart watch, its wrist strap has three NFC chips built in, which can be programmed to trigger functionality on your phone. In many ways this is a lot closer to projects like the Pressy or the Dimple.io that enable outside forces to power your smartphone to do simple tasks like take a photo or open a particular app. Next up, we have the Glance, which is a little device that you stick inside your regular watch wristband, which acts just like a typical smart watch. In other words, if you like the notification features of a smart watch like the Pebble, but hate the actual look of smart watches, you can keep using your own, and just slide this little device into the wrist band. It's a "smart accessory" to a watch to make it like a smart watch. Finally, we have the Modillian Smart Strap, which is very similar in concept to the Glance above, except rather than being a device that you slip into any watchband, this is a watchband itself that you can attach to basically any standard watch, again, allowing you to turn a more typically designed watch into a smart watch-like setup with certain notification powers.